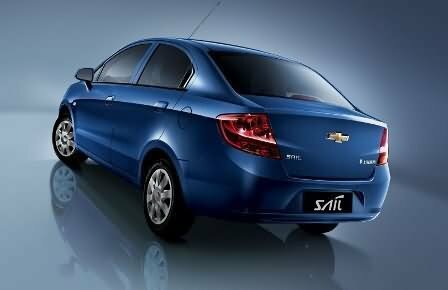 General Motors is launching its new car – Chevrolet Sail in India. The expected launch is in February 2011. The car is expected to be good value for money. With reasonable price, the company has tried to target the Indian middle class segment. Chevrolet Sail is expected to be available in Indian car market with six sizzling colours namely Crescent Silver, Jasmine White, Starfish Blue, Amber Orange, Coral Red and Sky Blue. The front of the car is broad and consists of larger head lamp cluster, round but small fog lamps slot, upper grille with a single horizontal split grille with the gold Chevrolet emblem in the middle. Door handles and side skirts, bumper, ORVMs are in body colour. The rear side comprises of a sleek tail lamp and Chevrolet emblem. 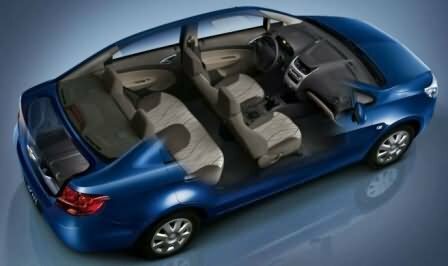 Chevrolet Sail has many comfort features for the occupants. The car is ultra spacious. There are 24 interior storage compartments for added convenience. There is sufficient space for leg, shoulder and head. The car also has ample boot space. The car is fitted with powerful climate control full automatic A.C. AC vents are placed in the front seat row only but efficient enough to cool the cabin. All the seats have head restraints for enhanced comfort except the passenger sitting between the rear passengers. The glove boxes present in front of both the front seats provide ample storage space in the dashboard. A small storage space is provided besides the gear knob. Hand rest is present for both the seat rows except for the fifth passenger in the second seat row. There is no middle hand rest. The car has a dynamic audio system that consists of a CD/MP3 player with a radio and speakers. Other comfort features include tinted glass, rack and pinion electric power steering column, rear defogger, keyless centre locking/ unlocking alarm system and remote fuel lid and boot opening. Chevrolet Sail has taken special care regarding safety aspect of the occupants. The car is fitted with front dual airbags, child safety locks, retractable steering column, antilock brakes with electronic brake force distribution. There are seat belts for all the seat rows. Chevrolet Sail comes loaded with a powerful 1.2 Litre S-TEC II and 1.4 Litre S-TEC III engines. The 1.2 Litre S- TEC II churns a top power of 53.1 KW/L with the help of a five speed manual gearbox. The 1.4 Litre S-TEC III produces a maximum power of 54.3 KW/L with the help of five speed manual transmission. The engines are mated with the Variable Geometry Intake-System (VGIS) for better power delivery and torque. The car also comes equipped with a TCU computer module which helps in choosing a feasible time for shifting gears. 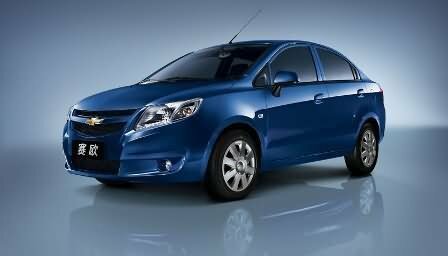 The price of the Chevrolet Sail is expected to be around Rs. 5 lakhs to 7 lakhs (taking Delhi as base price location). However, the price specified is indicative price only and reflects lowest approximate price which excludes tax, registration, insurance and cost of accessories. All this can happened with the cooperation between 2 big companies which are Chevrolet and Shanghai Automotive Industrial Corporation SAIC . The front part of the car is nearly similar with the Chevrolet Spark model.